Grant B. Park, 83, passed away suddenly at his home in St. George, Utah after a short illness. He was born on September 12th, 1935 to Loren Hugh and Alice Barnes Park. He resided in Nephi, Utah until he graduated from high school then lived in Payson, Ogden, Bountiful and spent the last 30 years in St. George, Utah after retiring from Utah Department of Transportation as a civil engineer after 29 years. He started a consulting business continuing to work in the same field for 5 years. He married Beth Ott, where they had 3 children, Lori (Dan) Kinnemore, Brett (Kathy) Park, and Terri (Kim) Thompsen. They later divorced and he married LaRene Hansen who he was married to for 42 years and gained 6 more great children, Vicki (Gaylen) Gough, Pam Hansen, Michael Dee Allen, Robert (Melizza) Hansen, Steve (Tammi) Hansen, and Chris (Barbara) Hansen. He had 4 siblings, Cleston (Marilyn) Park, Valene (Blaine) Breathwaite, Sylvia (Bob) Osterguard and Steve (Shirley) Park. He had 26 grandchildren, 30 great grandchildren and one great-great grandchild. He was preceded in death by his parents, LaRene (wife), siblings (Cleston and Valene) and son Robert. He loved the outdoors, camping, hiking, playing/watching sports, gardening and puttering around in his yard/garage while whistling a tune. He was very active right up until his death and was enrolled in college courses at Dixie University. 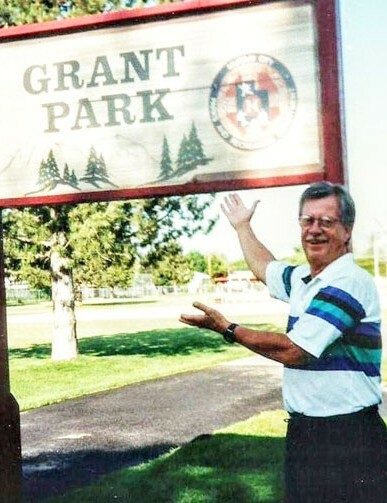 He excelled as a softball player in the St. George Senior League and the Huntsman Senior Games for several years and was invited to play in an international tournament. He enjoyed his time with LaRene camping, traveling and spending time with family. Though dad was not a man of many words, if he said something he meant it and was usually followed by a life lesson of instructions or recommendations. He was always looking to try something different and new to add to his vast knowledge. Memorial services will be held Monday, December 10th, 2018 at 1:00 p.m. at the LDS Stake Center located at 351 N. 100 W, Nephi, Utah. Visitation will be from 12:00-12:45 p.m. December 10th, 2018. Interment will be held at Vine Bluff Cemetery, Nephi, Utah.